Absolute Pressure - Total pressure measured from zero. Absolute Temperature - See Temperature, Absolute. Absorption - The chemical process by which a hygroscopic desiccant, having a high affinity with water, melts and becomes a liquid by absorbing the condensed moisture. Actual Capacity - Quantity of gas actually compressed and delivered to the discharge system at rated speed and under rated conditions. Also called Free Air Delivered (FAD). Adiabatic Compression - See Compression, Adiabatic. Adsorption - The process by which a desiccant with a highly porous surface attracts and removes the moisture from compressed air. The desiccant is capable of being regenerated. Air Receiver - See Receiver. Air Bearings - See Gas Bearings. Aftercooler - A heat exchanger used for cooling air discharged from a compressor. Resulting condensate may be removed by a moisture separator following the aftercooler. Atmospheric Pressure - The measured ambient pressure for a specific location and altitude. Automatic Sequencer - A device which operates compressors in sequence according to a programmed schedule. Brake Horsepower (bhp) - See Horsepower, Brake. Capacity - The amount of air flow delivered under specific conditions, usually expressed in cubic feet per minute (cfm). Capacity, Actual - The actual volume flow rate of air or gas compressed and delivered from a compressor running at its rated operating conditions of speed, pressures, and temperatures. Actual capacity is generally expressed in actual cubic feet per minute (acfm) at conditions prevailing at the compressor inlet. Check Valve - A valve which permits flow in only one direction. Clearance - The maximum cylinder volume on the working side of the piston minus the displacement volume per stroke. Normally it is expressed as a percentage of the displacement volume. Clearance Pocket - An auxiliary volume that may be opened to the clearance space, to increase the clearance, usually temporarily, to reduce the volumetric efficiency of a reciprocating compressor. Compression, Adiabatic - Compression in which no heat is transferred to or from the gas during the compression process. Compression, Isothermal - Compression is which the temperature of the gas remains constant. Compression, Polytropic - Compression in which the relationship between the pressure and the volume is expressed by the equation PVn is a constant. Compression Ratio - The ratio of the absolute discharge pressure to the absolute inlet pressure. Constant Speed Control - A system in which the compressor is run continuously and matches air supply to air demand by varying compressor load. Critical Pressure - The limiting value of saturation pressure as the saturation temperature approaches the critical temperature. Critical Temperature - The highest temperature at which well-defined liquid and vapor states exist. Sometimes it is defined as the highest temperature at which it is possible to liquefy a gas by pressure alone. Cubic Feet Per Minute (cfm) - Volumetric air flow rate. cfm, free Air - cfm of air delivered to a certain point at a certain condition, converted back to ambient conditions. Actual cfm (acfm) - Flow rate of air at a certain point at a certain condition at that point. Inlet cfm (icfm) - Cfm flowing through the compressor inlet filter or inlet valve under rated conditions. Standard cfm (scfm) - Flow of free air measured and converted to a standard set of reference conditions (14.5 psia, 68ºF, and 0% relative humidity). Cut-In/Cut-Out Pressure - Respectively, the minimum and maximum discharge pressures at which the compressor will switch from unload to load operation (cut in) or from load to unload (cut out). Cycle - The series of steps that a compressor with unloading performs; 1) fully loaded, 2) modulating (for compressors with modulating control), 3) unloaded, 4) idle. Cycle Time - Amount of time for a compressor to complete one cycle. Degree of Intercooling - The difference in air or gas temperature between the outlet of the intercooler and the inlet of the compressor. Deliquescent - Melting and becoming a liquid by absorbing moisture. Desiccant - A material having a large proportion of surface pores, capable of attracting and removing water vapor from the air. Dew Point - The temperature at which moisture in the air will begin to condense if the air is cooled at constant pressure. At this point the relative humidity is 100%. The temperature to which air must be cooled, at a given pressure and water-vapor content, for it to reach saturation; the temperature at which dew begins to form. Demand - Flow of air at specific conditions required at a point or by the overall facility. Diaphragm - A stationary element between the stages of a multi-stage centrifugal compressor. It may include guide vanes for directing the flowing medium to the impeller of the succeeding stage. In conjunction with an adjacent diaphragm, it forms the diffuser surrounding the impeller. Diaphragm cooling - A method of removing heat from the flowing medium by circulation of a coolant in passages built into the diaphragm. Diffuser - A stationary passage surrounding an impeller, in which velocity pressure imparted to the flowing medium by the impeller is converted into static pressure. Digital Controls - See Logic Controls. Discharge Pressure - Air pressure produced at a particular point in the system under specific conditions. Discharge Temperature - The temperature at the discharge flange of the compressor. Displacement - The volume swept out by the piston or rotor(s) per unit of time, normally expressed in cubic feet per minute. Droop - The drop in pressure at the outlet of a pressure regulator, when a demand for air occurs. 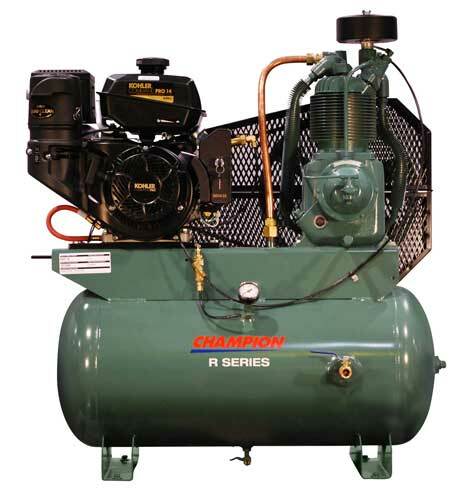 Efficiency, Compression - Ratio of theoretical power to power actually imparted to the air or gas delivered by the compressor. Efficiency, Isothermal - Ratio of the theoretical work (as calculated on an isothermal basis) to the actual work transferred to a gas during compression. 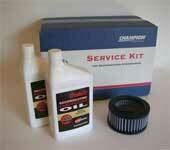 Efficiency, Mechanical - Ratio of power imparted to the air or gas to brake horsepower (bhp). Efficiency, Polytropic - Ratio of the polytropic compression energy transferred to the gas, to the actual energy transferred to the gas. Efficiency, Volumetric - Ratio of actual capacity to piston displacement. Exhauster - A term sometimes applied to a compressor in which the inlet pressure is less than atmospheric pressure. Expanders - Turbines or engines in which a gas expands, doing work, and undergoing a drop in temperature. Use of the term usually implies that the drop in temperature is the principle objective. The orifice in a refrigeration system also performs this function, but the expander performs it more nearly isentropically, and thus is more effective in cryogenic systems. Filters - Devices for separating and removing particulate matter, moisture or entrained lubricant from air. Flange connection - The means of connecting a compressor inlet or discharge connection to piping by means of bolted rims (flanges). Fluidics - The general subject of instruments and controls dependent upon low rate of flow of air or gas at low pressure as the operating medium. These usually have no moving parts. Free Air - Air at atmospheric conditions at any specified location, unaffected by the compressor. Full-Load - Air compressor operation at full speed with a fully open inlet and discharge delivering maximum air flow. Gas - One of the three basic phases of matter. While air is a gas, in pneumatics the term gas normally is applied to gases other than air. Gas bearings - Load carrying machine elements permitting some degree of motion in which the lubricant is air or some other gas. Gauge Pressure - The pressure determined by most instruments and gauges, usually expressed in psig. Barometric pressure must be considered to obtain true or absolute pressure. Guide vane - A stationary element that may be adjustable and which directs the flowing medium approaching the inlet of an impeller. Head, Adiabatic - The energy, in foot pounds, required to compress adiabatically to deliver one pound of a given gas from one pressure level to another. Head, Polytropic - The energy, in foot pounds, required to compress polytropically to deliver one pound of a given gas from one pressure level to another. Horsepower, Brake - Horsepower delivered to the output shaft of a motor or engine, or the horsepower required at the compressor shaft to perform work. Horsepower, Indicated - The horsepower calculated from compressor indicator diagrams. The term applies only to displacement type compressors. Horsepower, Theoretical or Ideal - The horsepower required to isothermally compress the air or gas delivered by the compressor at specified conditions. Humidity, Relative - The relative humidity of a gas (or air) vapor mixture is the ratio of the partial pressure of the vapor to the vapor saturation pressure at the dry bulb temperature of the mixture. Humidity, Specific - The weight of water vapor in an air vapor mixture per pound of dry air. Hysteresis - The time lag in responding to a demand for air from a pressure regulator. Impeller - The part of the rotating element of a dynamic compressor which imparts energy to the flowing medium by means of centrifugal force. It consists of a number of blades which rotate with the shaft. Indicated Power - Power as calculated from compressor-indicator diagrams. Indicator card - A pressure - volume diagram for a compressor or engine cylinder, produced by direct measurement by a device called an indicator. Inducer - A curved inlet section of an impeller. Inlet Pressure - The actual pressure at the inlet flange of the compressor. Intercooling - The removal of heat from air or gas between compressor stages. Intercooling, degree of - The difference in air or gas temperatures between the inlet of the compressor and the outlet of the intercooler. Intercooling, perfect - When the temperature of the air or gas leaving the intercooler is equal to the temperature of the air or gas entering the inlet of the compressor. Isentropic compression - See Compression, Isentropic. Isothermal compression - See Compression, Isothermal. Leak - An unintended loss of compressed air to ambient conditions. Liquid piston compressor - A compressor in which a vaned rotor revolves in an elliptical stator, with the spaces between the rotor and stator sealed by a ring of liquid rotating with the impeller. Load Factor - Ratio of average compressor load to the maximum rated compressor load over a given period of time. Load Time - Time period from when a compressor loads until it unloads. Load/Unload Control - Control method that allows the compressor to run at full-load or at no load while the driver remains at a constant speed. Modulating Control - System which adapts to varying demand by throttling the compressor inlet proportionally to the demand. Multi-casing compressor - Two or more compressors, each with a separate casing, driven by a single driver, forming a single unit. Multi-stage axial compressor - A dynamic compressor having two or more rows of rotating elements operating in series on a single rotor and in a single casing. Multi-stage centrifugal compressor - A dynamic compressor having two or more impellers operating in series in a single casing. Multi-stage compressors - Compressors having two or more stages operating in series. Perfect Intercooling - The condition when the temperature of air leaving the intercooler equals the air at the compressor intake. Performance curve - Usually a plot of discharge pressure versus inlet capacity and shaft horsepower versus inlet capacity. Piston Displacement - The volume swept by the piston; for multistage compressors, the piston displacement of the first stage is the overall piston displacement of the entire unit. Pneumatic Tools - Tools that operate by air pressure. Polytropic compression - See Compression, Polytropic. Polytropic head - See Head, Polytropic. Positive displacement compressors - Compressors in which successive volumes of air or gas are confined within a closed space and the space mechanically reduced, resulting in compression. These may be reciprocating or rotating. Power, theoretical (polytropic) - The mechanical power required to compress polytropically and to deliver, through the specified range of pressures, the gas delivered by the compressor. Pressure- Force per unit area, measured in pounds per square inch (psi). Pressure, Absolute - The total pressure measured from absolute zero (i.e. from an absolute vacuum). Pressure, Critical - See Critical Pressure. Pressure Dew Point - For a given pressure, the temperature at which water will begin to condense out of air. Pressure Drop - Loss of pressure in a compressed air system or component due to friction or restriction. Pressure, Intake - The absolute total pressure at the inlet connection of a compressor. Pressure Range - Difference between minimum and maximum pressures for an air compressor. Also called cut in-cut out or load-no load pressure range. Pressure ratio - See Compression Ratio. Pressure rise - The difference between discharge pressure and intake pressure. Pressure, Static - The pressure measured in a flowing stream in such a manner that the velocity of the stream has no effect on the measurement. Pressure, Total - The pressure that would be produced by stopping a moving stream of liquid or gas. It is the pressure measured by an impact tube. Pressure, Velocity - The total pressure minus the static pressure in an air or gas stream. Rated Capacity - Volume rate of air flow at rated pressure at a specific point. 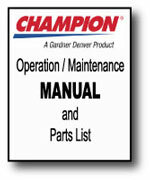 Rated Pressure - The operating pressure at which compressor performance is measured. Required Capacity - Cubic feet per minute (cfm) of air required at the inlet to the distribution system. Receiver - A vessel or tank used for storage of gas under pressure. In a large compressed air system there may be primary and secondary receivers. Reciprocating compressor - Compressor in which the compressing element is a piston having a reciprocating motion in a cylinder. Relative Humidity - The ratio of the partial pressure of a vapor to the vapor saturation pressure at the dry bulb temperature of a mixture. Reynold number - A dimensionless flow parameter (h < D/:), in which h is a significant dimension, often a diameter, < is the fluid velocity, D is the mass density, and : is the dynamic viscosity, all in consistent units. Rotor - The rotating element of a compressor. In a dynamic compressor, it is composed of the impeller(s) and shaft, and may include shaft sleeves and a thrust balancing device. Seals - Devices used to separate and minimize leakage between areas of unequal pressure. Sequence - The order in which compressors are brought online. Shaft - The part by which energy is transmitted from the prime mover through the elements mounted on it, to the air or gas being compressed. Sole plate - A pad, usually metallic and embedded in concrete, on which the compressor and driver are mounted. Specific gravity - The ratio of the specific weight of air or gas to that of dry air at the same pressure and temperature. Specific Humidity - The weight of water vapor in an air-vapor mixture per pound of dry air. 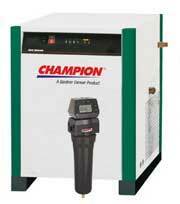 Specific Power - A measure of air compressor efficiency, usually in the form of bhp/100 acfm. Specific Weight - Weight of air or gas per unit volume. Speed - The speed of a compressor refers to the number of revolutions per minute (rpm) of the compressor drive shaft or rotor shaft. Stages - A series of steps in the compression of air or a gas. Standard Air - The Compressed Air & Gas Institute and PNEUROP have adopted the definition used in ISO standards. This is air at 14.5 psia (1 bar); 68 F (20 C) and dry (0% relative humidity). Start/Stop Control - A system in which air supply is matched to demand by the starting and stopping of the unit. Super compressibility - See Compressibility. Surge - A phenomenon in centrifugal compressors where a reduced flow rate results in a flow reversal and unstable operation. Surge limit - The capacity in a dynamic compressor below which operation becomes unstable. Temperature, Absolute - The temperature of air or gas measured from absolute zero. It is the Fahrenheit temperature plus 459.6 and is known as the Rankine temperature. In the metric system, the absolute temperature is the Centigrade temperature plus 273 and is known as the Kelvin temperature. Temperature, Critical - See Critical Temperature. Temperature, Discharge - The total temperature at the discharge connection of the compressor. Temperature, Inlet - The total temperature at the inlet connection of the compressor. Temperature Rise Ratio - The ratio of the computed isentropic temperature rise to the measured total temperature rise during compression. For a perfect gas, this is equal to the ratio of the isentropic enthalpy rise to the actual enthalpy rise. Temperature, Static - The actual temperature of a moving gas stream. It is the temperature indicated by a thermometer moving in the stream and at the same velocity. Temperature, Total - The temperature which would be measured at the stagnation point if a gas stream were stopped, with adiabatic compression from the flow condition to the stagnation pressure. Theoretical Power - The power required to compress a gas isothermally through a specified range of pressures. Torque - A torsional moment or couple. This term typically refers to the driving couple of a machine or motor. Total Package Input Power - The total electrical power input to a compressor, including drive motor, belt losses, cooling fan motors, VSD or other controls, etc. Unit type compressors - Compressors of 30 bhp or less, generally combined with all components required for operation. Unload - (No load) Compressor operation in which no air is delivered due to the intake being closed or modified not to allow inlet air to be trapped. Vacuum pumps - Compressors which operate with an intake pressure below atmospheric pressure and which discharge to atmospheric pressure or slightly higher. Valves - Devices with passages for directing flow into alternate paths or to prevent flow. Volute - A stationary, spiral shaped passage which converts velocity head to pressure in a flowing stream of air or gas. 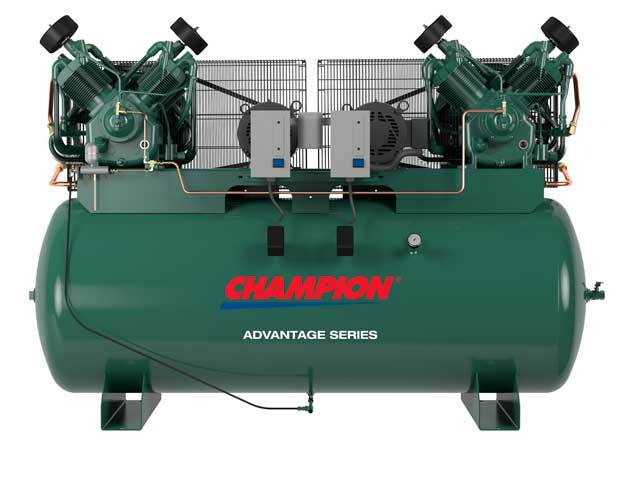 Water-cooled compressor - Compressors cooled by water circulated through jackets surrounding cylinders or casings and/or heat exchangers between and after stages.